Learn about trends in the Beauty Salon, Hair Salon and hair care services business and where to find more info about how to open your own Beauty Salon. Don’t forget you can receive free or low-cost training and free professional business advice, from your local Small Business Development Center! Get a free Beauty Salon business plan template on our Business Plans page. This Beauty Salon industry summary is from First Research which also sells a full version of this hair care services industry report. 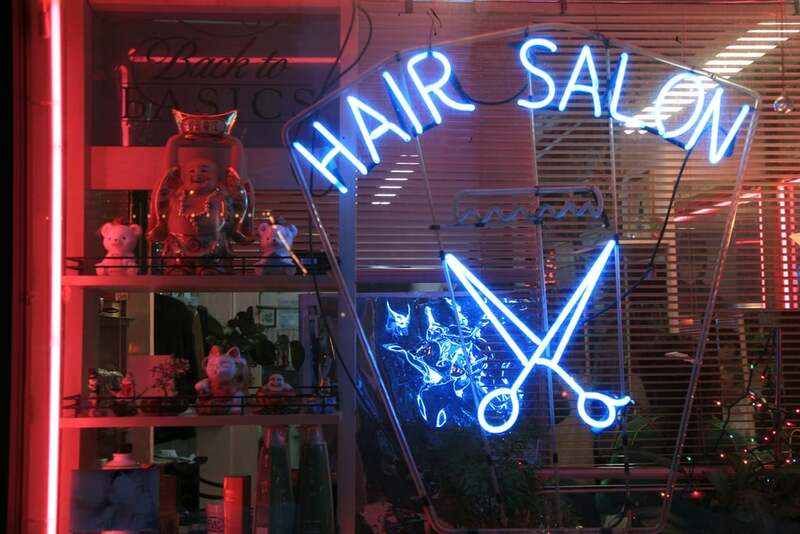 The US hair care services industry includes about 86,000 establishments (82,000 beauty salons; 4,000 barber shops) with combined annual revenue of about $20 billion. Major companies include Regis, Ratner Companies, Premier Salons, and Sport Clips. Demand is driven by demographics and population growth. The profitability of individual companies depends on technical expertise and marketing skills. Large companies enjoy economies of scale in purchasing and marketing. Small companies can compete successfully by offering superior service or securing favorable locations. The US industry is highly fragmented: the 50 largest companies generate about 15 percent of revenue. Major products are hair cutting, hair coloring, nail care, skin care, and merchandise sales. A typical salon offers haircutting and styling, coloring, shampooing, and permanents. Some salons also offer nail care, facial treatments, makeup, bikini waxing, massage, tanning, and other types of spa treatments but the lower volume of demand for such specialty services often makes them uneconomical. Sales of hair care products are an important revenue source for many salons, providing from 5 to 15 percent of revenue. Gross margins are higher for hair care products than for services. A typical salon occupies about 1,000 to 1,500 square feet and is located in a mall or strip center. The following Beauty Salon market research report summary is from IBISWorld which also sells a full version of this report. Revenue growth is expected to improve over the next five years, rising at an average annual rate of 3.2% to $58.7 billion by 2019. This will be driven by increases in per capita disposable income and declining unemployment over the five-year period. Higher disposable incomes will also lead hair salon customers to spend more on higher-value services such as manicures, pedicures, facials, hair modification treatments, and massages. Industry profit is also expected to see gains which could encourage more new businesses to enter the industry. Profits have increased from 1.9% in 2009 to 5.7% in 2014. Continued profit gains will be mainly due to increased sales of higher-value products which have larger profit margins. Improving market conditions continue to increase the number of industry operators at an average annual rate of 5.5%, reaching 1.3 million operators by 2019. This growing number of industry operators will drive employment growth. The improving job market will continue to contribute to higher enrollments at cosmetology schools. This continued trend, combined with the growth in new industry operators, has driven beauty salon employment upwards at an average annual rate of 3.8%, reaching 1.7 million employees in the five years to 2014. The following facts are from Best Customers: Demographics of Consumer Demand, which provides detailed information on consumer demographics for many industries. This resource, and other demographics and marketing materials are available for purchase from New Strategist. The largest households and older householders are the best customers of personal care services such as haircuts, massages, manicures, and facials. Householders aged 35 to 64 spend 8 to 14 percent more than average on this item. Married couples without children at home (most of them empty-nesters) spend 25 percent more than average on personal care services, while those with school-aged or older children at home (the largest households) spend 31 to 37 percent more than average. The best customers of hair care products are the largest households and households with the most women. Married couples with children at home spend 58 percent more than average on this item, the figure peaking at 65 percent more than average among couples with preschoolers. Householders aged 35 to 54, many with children at home, spend 25 to 28 percent more than average on hair care products and control half the market. Information on Hair Salon, Beauty Salon and Barber Shop business licensing requirements in your local area. Here is a Beauty Salon labor market summary from the Bureau of Labor Statistics. 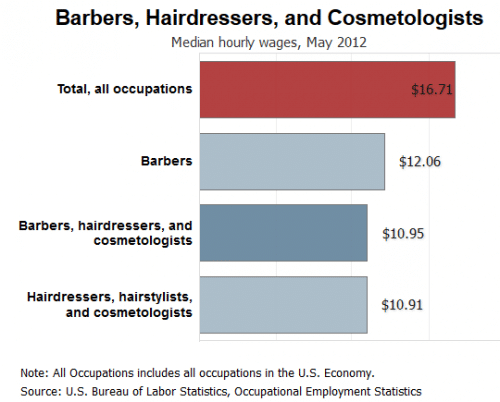 In May 2012, the median hourly wage for barbers, hairdressers, and cosmetologists was $10.95. The median wage is the wage at which half the workers in an occupation earned more than that amount and half earned less. 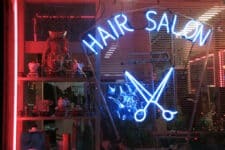 Barbers, hairdressers, and cosmetologists held about 663,300 jobs in 2012. Nearly half were self-employed. Barbers, hairdressers, and cosmetologists work mostly in a barbershop or salon, although some work in a spa, hotel, or resort. Some lease booth space in other people’s salons. Some manage salons or open their own after several years of experience. Barbers, hairdressers, and cosmetologists usually work in pleasant surroundings with good lighting. Physical stamina is important, because they are on their feet for most of their shift. Prolonged exposure to some chemicals may cause irritation, so they might wear protective clothing, such as disposable gloves or aprons. Many barbers, hairdressers, and cosmetologists work part time. However, some self-employed workers may have long hours. Work schedules often include evenings and weekends―the times when barbershops and beauty salons are busiest. Those who are self-employed usually determine their own schedules. Overall employment of barbers, hairdressers, cosmetologists, and shampooers is projected to grow 13 percent from 2012 to 2022, as fast as the average for all occupations. Growth rates will vary by specialty. Employment of barbers is projected to grow 11 percent from 2012 to 2022, as fast as the average for all occupations. The need for barbers will stem primarily from an increasing population, which will lead to greater demand for basic hair-care services. Employment of hairdressers, hairstylists, and cosmetologists is projected to grow 13 percent from 2012 to 2022, about as fast as the average for all occupations. Demand for hair coloring, hair straightening, and other advanced hair treatments has increased in recent years, a trend that is expected to continue over the coming decade. Overall job opportunities for barbers, hairdressers, and cosmetologists are expected to be good. A large number of job openings will stem from the need to replace workers who transfer to other occupations, retire, or leave the occupations for other reasons. However, workers should expect strong competition for jobs and clients at higher paying salons, of which there are relatively few and for which applicants must compete with a large pool of experienced hairdressers and cosmetologists.